Just four months after putting together an offensive-focused 2018 draft class, highlighted by first round rookie quarterback Lamar Jackson, the Baltimore Ravens showcased their young talent in the league’s annual Hall of Fame Game with a 17-16 victory over the Chicago Bears Thursday, Aug. 8 at the Tom Benson Hall of Fame Stadium in Canton, Ohio. Last season, Baltimore led the NFL in takeaways with 34 and the team picked up where they left off in that category on the first drive of the game as safety Chuck Clark snagged an interception in the red zone off a deflected pass. Robert Griffin III started at quarterback for the Ravens and the offense got off to a shaky start following the forced turnover. On Baltimore’s initial third down of the game, Griffin III delivered a strike over the middle to wide receiver Breshad Perriman, but Perriman couldn’t reel in the ball and Bears safety Deandre Houston-Carson notched an interception off the mishandled catch. Perriman, a first round selection in the 2015 NFL Draft, has made little impact in his time with the Ravens and is looking for a breakout campaign this season, but his inconsistency in route running and making routine catches is a concern. Chicago found the endzone just six plays after the turnover, but Griffin III responded with a touchdown drive of his own as he connected with tight end Maxx Williams near the goal line for a score. Baltimore’s defense stepped up once again on its next possession as linebacker Kamalei Correa recorded an interception on a pass over the middle to put the Ravens in good scoring position. Correa has also had a disappointing career so far, but looked impressive on the night finishing with three sacks and a forced fumble to go along with his interception. With the Ravens planning on using more odd man fronts this season, Correa could find a role on the team as a pass rusher or a coverage linebacker. Following the takeaway, Baltimore scored a short field goal to take a 10-7 advantage heading into the second quarter. Quarterback Josh Woodrum took some snaps in the period, but he could not replicate his breakout performance from last preseason as the team took their three-point lead into halftime. The Ravens opened the second half with their coveted first round picks as Jackson and rookie tight end Hayden Hurst made their debuts. Jackson looked out of sorts at first, but showed the impressive speed and elusiveness that helped him win the Heisman Trophy in 2016. Baltimore’s defense gifted Jackson with a short field after recovering a forced fumble on their first possession of the game. 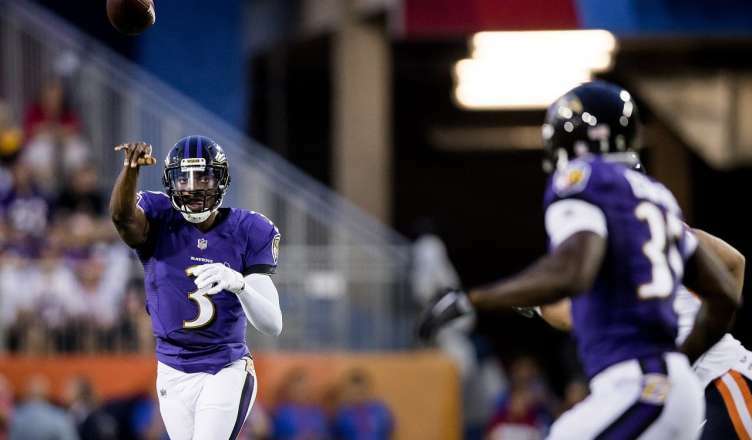 Jackson capitalized on the opportunity as he marched the team into the red zone and found Hurst near the sideline for an 8-yard touchdown pass, giving the Ravens a 17-7 lead. Though Jackson flashed at times, the largest concern with his play is that he didn’t slide whenever he scrambled. Since Jackson relies on his athleticism so much, it is important that he learns how to protect himself when he’s out of the pocket. Despite a comeback attempt by the Bears, Baltimore held on for the win with a signature defensive stand late in the game. Quarterback Joe Flacco made an impressive preseason debut in a 33-7 win over the Los Angeles Rams Thursday, Aug. 9 at M&T Bank Stadium. Flacco only played the first drive of the game, but he looked more mobile than he did at any point during the 2017 regular season in which he was coming off an offseason back injury. He finished 5-of-7 for 71 yards and closed out the drive with a six-yard touchdown toss to fullback Patrick Ricard. Jackson took control under center for the rest of the first half and looked more poised than in his first appearance. On his first possession, he made multiple highlight plays as he drove his team down the field. On the second play of the drive, he completed a 36-yard pass to wide receiver Chris Moore and he capped off the drive with a 9-yard touchdown run off a broken pass play. It is clear that Jackson has impressive raw speed, but once he is able to hone in on the mental aspect of playing quarterback he could become difficult to stop. The Ravens put in three field goals before the break to take a 23-0 lead going into halftime. Early in the third quarter, outside linebacker Tim Williams executed a savvy dip move to get around an offensive lineman and force a strip sack. Williams, a third round selection from the 2017 NFL Draft, did not play much last season and is looking to earn more reps this year. The play of the day came midway through the fourth quarter as Griffin III entered the game and launched a 32-yard touchdown pass to Perriman. Perriman skied over the defender and showed good concentration to keep his feet in as he landed in the back of the end zone. That play could improve his confidence over the next few contests. Los Angeles scored a touchdown midway through the fourth to prevent a shutout, but Baltimore secured the win.